This Barge or Measham-ware tea pot was used at Swaffham Wesleyan Church, Norfolk. The tea pot was commissioned in1875 by a Mr Cory who had been born in Swaffham. When his work as a jeweller took him away from Swaffham to Nottingham, he gave the tea pot as a farewell gift to the Church he had come to love. Measham Ware is the pottery of choice of the canal boat community. There is a long tradition of customers being able to order a bespoke pot with the dedication or motto of their choice. The pots were often carried to the customers by barge. 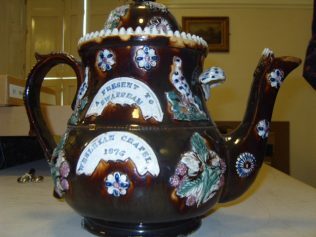 The tea pot is now in the collection of Swaffham Museum where it can be viewed by appointment. Many local museums hold items of interest to Methodist Family History Researchers. It is always worth enquiring.